First and foremost, I love all my wonderful readers!! If it wasn't for you this blog wouldn't be. Thank you! Let's all stay in touch, take a minute to subscribe to Epicurean Mom by email or RSS feed and on Facebook. I'm boycotting our sunny California weather and dipping into a nice warm bowl of homemade soup! I've been patiently, or not so patiently, waiting for a cold winter day to make a simmering bowl of goodness! Alas, it hasn't happened. Next option? To make one anyway! Finding the right method for cooking vegetables is important, since it's a pretty well known fact: Vegetables are good for you! A lot of people see eating veggies as a chore. Well, it doesn't have to be that way. Vegetables can actually be very tasty! Roasting gives the vegetables a unique flavor. Cooking them slowly in the oven helps to caramelize and enhance the natural sweetness. Even though it takes a while to roast, the prep time is virtually non-existent! Just toss vegetables with olive oil and herbs, put in a baking dish and let them roast! So easy and tastes much better then steaming or boiling. I'm a savory sweet gal, so I thought adding a touch of apple and sage to the sweet potatoes would be a yummy addition, and it was! This recipe is so easy to modify to your liking. 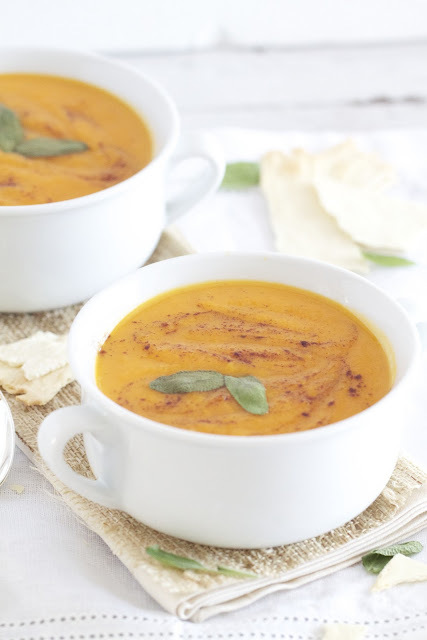 Add a dash of cinnamon and/or nutmeg to give it a real harvest kick! Preheat oven to 350 degrees. Wash and dry potatoes. Place whole potatoes on a baking sheet drizzle with 1 tablespoon olive oil. Bake for 40-45 minutes, or until soft and cooked through. Cut into 2-inch pieces. Set aside. Pour remaining 2 tablespoons olive oil in a dutch oven over medium heat. Add onions, apples and sage. Cook until onions are soft and translucent. Mix 1/4 cup apple cider and veggie broth. Bring to a boil then reduce heat to simmer. Cover and cook until the apples are soft, about 10-15 minutes. Place the potato chunks in the dutch oven, using an immersion blender or blender, blend until pureed. Add milk, salt, pepper, cinnamon and nutmeg, mixing well. Spoon into bowls, garnish with cinnamon and sage leaves. An absolutely gorgeous soup Katie!!!! 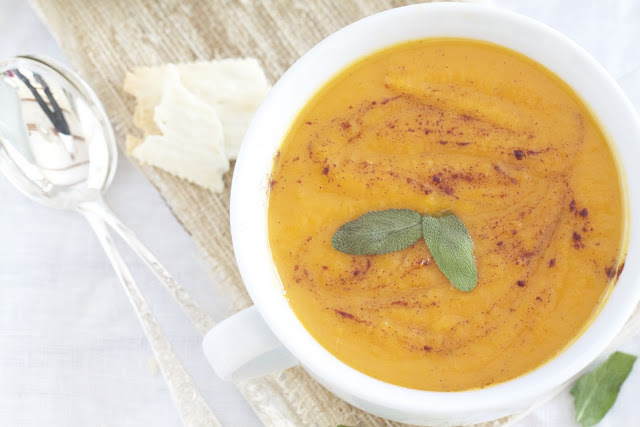 Sweet potato and apple sounds like a great combination! I'll have to try it when the weather cools down here. I've added you to my reader :) You've been on it for a while. I LOVE your blog! This soup looks amazing and beautiful! Can't wait to share with you and continue to see what you have in store :) everything you make looks amazing! Beautiful soup! It sounds delicious, and your pictures are gorgeous :D I wish I had a bowl of this waiting for lunch! What a great flavor combo! We have rain in the forecast over the next few days, so I think a pot of this soup is in order! This is perfect for the weather in Kansas City today. The wind chill is in the single digits. BRR! Soup is perfect though. And I love roasted sweet potatoes. This combination of flavors is mouthwatering, Katie! What an interesting combination, sounds delicious! Also I don't know if I have ever mentioned it, but I LOVE your blog layout! 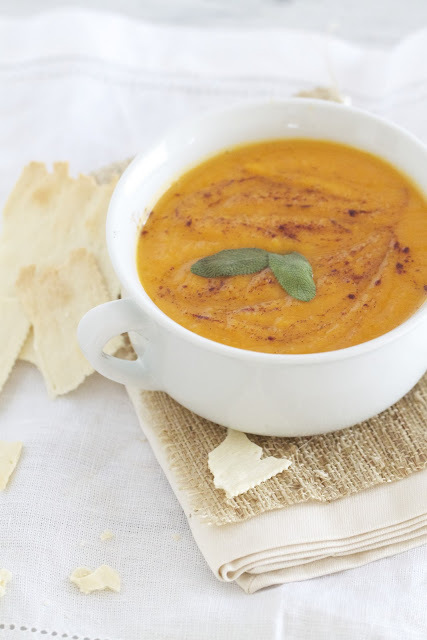 A fantastic soup and gorgeous flavor combination! It looks so appetizing. I love that savory sweet combination as well, this is a beautiful soup. I made it- super delicious Katie! Thanks for the recipe! Katie I am sorry I am so behind on my reading. This looks really amazing. I am not a big soup girl but this one looks amazing. do you peel the sweet potatos or you roast them and blend them with the skin on? i want try this one, i have sage from my garden that i need to use and this one is perfect!